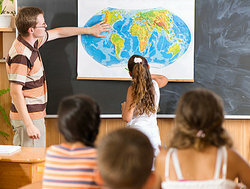 An ESL social studies unit can encompass a wide variety of topics. Often called content-based ESL, social studies lessons will help students incorporate new words into their vocabulary while learning valuable information about American culture. This knowledge will help them feel more comfortable interacting with other English speakers. Making connections between their experience and your lesson will broaden their understanding of the content and expand their vocabulary. The discussion allows the students to practice conversational English as they learn about other forms of government and presidential power. Does their home country have a president? How is that president's power different? Is it a dictatorship or a democracy? If you're teaching a mixed group, create opportunities for ESL students to participate even if they don't fully understand the content. Speak slowly so they can at least focus on your words. Also, give definitions of difficult words whenever possible. Social studies cover a wide variety of topics from history to geography. When choosing a topic for your ESL students, choose one they will be able to comprehend given their language proficiency. For example, it is probably not a good idea to get into a discussion about slavery with a beginning ESL student unless you have a lot of time to develop the student's understanding of the concept. Because slavery is a complex topic that may be a foreign concept, that discussion will be more effective with a more advanced ESL student. Religion and geography on the other hand are great topics for beginners. There are a number of ways to create content-based ESL lessons. One way is to start with a standard social studies lesson and modify it to include concepts and language for your ESL student. This method is probably more effective for mixed classes. Because social studies is a broad subject, you can also incorporate the topics into your general ESL lessons, likely to be the more effective method for ESL only classes. Teachers Helping Teachers has a great list of detailed lessons which is updated weekly during the school year. Some of them incorporate multicultural concepts. For example, there was a lesson on Christmas around the world. This would have been great for beginning ESL students. EverythingESL is a great resource for content-based ESL lessons. There are a number of social studies lessons including ones on history and culture. "ESL Social Studies Unit." YourDictionary, n.d. Web. 21 April 2019. <https://esl.yourdictionary.com/lesson-plans/esl-social-studies-unit.html>.